I've had quite a few requests for this tutorial, so I wanted to to get it in before this year ends. It's the right time too, I guess, with all the parties coming up. Maybe those of you have never ever worn false lashes can practice now, and be ready to glam up your eyes even more on New Year's Eve! Step 1: Apply black liquid or gel liner. I'm using Bourjois Liner Feutre Felt Tip Eyeliner. Step 2: Curl your natural lashes, so they don't fall limp when you layer the false ones on top of them. I'm using Shu Uemura Gold Eyelash Curler. Step 4: Glue a dot on both ends of lashes. The ends are most likely to come off, so I like to make sure they're glued properly. Step 5: Apply glue on the whole band or vein. Try not to smudge it too much on the lashes or they'll stick to your natural lashes. Wait about 20 seconds for the glue to get tacky. Step 6: Hold them pointing the band downwards and try to place on the center of lash line first. Do it carefully, so the glued ends don't touch your lid. Step 7: With tweezers or an eyelash applicator, stick the outer end. Do it carefully, so the glued band doesn't touch your lid. I'm using Tweezerman Tweezers. Step 8: Check if inner end aligns with the starting point of your natural lashes. If it looks too long, pull from outer end. This is easily done when you do it quickly while glue hasn't dried completely. Step 9: Stick the inner end. See the end point? It won't poke the tear duct. Step 10: Use the end of your tweezers to press the band down. Make sure there are no gaps. Step 11: With a finger, lift both your natural and false lashes, and press down to make sure the false lash is sitting close to your natural lash line. 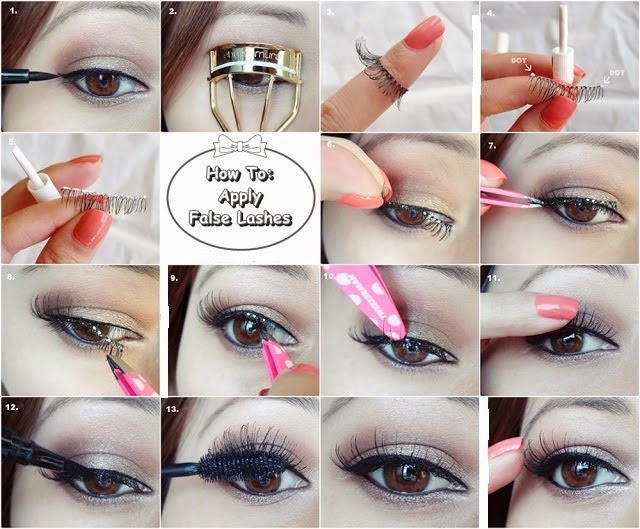 Also pinch them both together so the false lashes don't point up too much. Step 12: The glue usually dries clear, but sometimes you still see white spots. Use black liner to darken the spots. Step 13: Apply black mascara to blend the false and real lashes together. Coat the base of your natural lashes well. This will stiffen your natural lashes and help them hold up the false ones. I prefer to use an old-ish mascara that's dried up a bit for this.